The Canyon Blaster at Circus Circus races along its track at speeds of up to 55 miles-an-hour, causing its riders to grip tightly to the handle bars and gasp as they twist and turn through the remainder of the ride. In 1993, the Canyon Blaster was one of the first four rides at the Adventuredone, Circus Circus's indoor amusement park. Though it was known at the time as the Grand Slam Canyon, it was and remains the United States' only indoor double-loop, double-corkscrew roller coaster. The roller coaster was custom-designed to fit indoors, but being indoors doesn't limit the excitement of the ride. 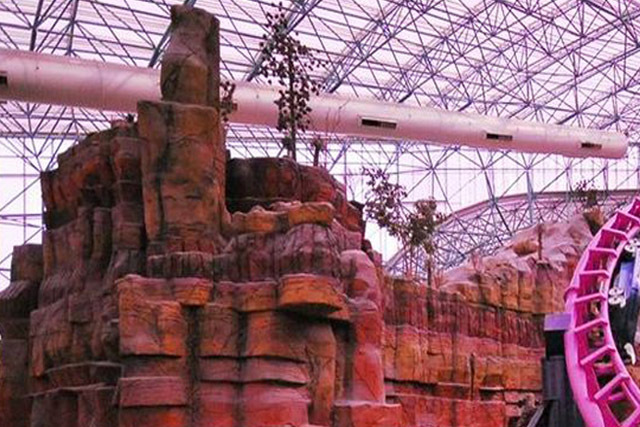 Canyon Blaster stretches 90 feet into the air, allowing riders to great a great view of the entire Adventuredome. One segment of the roller coaster's track even comes close to the Chaos ride, adding to the excitement. Canyon Blaster is decidedly one of the best roller coasters in Las Vegas.